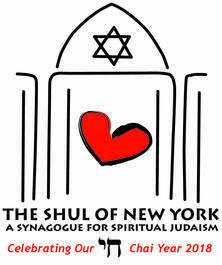 The Shul of New York is joining Women's March Alliance for the NYC march on Saturday, January 19th! The Shul is not a sponsoring group, but we encourage you to join the march! The March will start immediately following the rally and end when the last marcher crosses 6th Ave & W 45th St, probably late afternoon. Fighting for equality requires the strength of all genders and all ages. All are welcome. This will be a peaceful march. Registration is not required but will help Women's Alliance communicate changes in time and location with you. It will also help to plan the safest route with the NYPD. All marchers who selected ‘GOING’ on Facebook or registered via Eventbrite will receive electronic notifications if the event time or location changes. Women's Alliance advises non-registered marchers to check the event details on Facebook or Eventbrite before heading out to the event as changes to the location and time may occur. This is an outdoor event. Layering your clothing and wearing very comfortable shoes is recommended. Be prepare for unexpected snow, sleet, or ice. There will not be heaters and we will march rain or shine. We discourage large bags or backpacks but they are permitted. BE ADVISED: NYPD will be doing soft bag checks. (This is similar to what museums do.) They discourage large bags. Homemade posters that show who you are and express your sentiment! For safety and the comfort of all marchers, it is recommended that you do not bring large backpacks or purses. In such a large crowd, smaller is better. For safety, posters and signs should be made of paper, poster board, or cardboard like materials. Holiday wrapping paper rolls can be used in lieu of wooden sticks. Wooden poles, sticks, or handles (yes, even flagpoles are prohibited). Metal wires or handles of any kind. Bring mini-flags at your own risk. Be advised that the NYPD may confiscate them. Signs made with prohibited materials will be confiscated by NYPD as they threaten the safety of other marchers.